ADHD Training - Anywhere, Anytime! The ADHD Academy provides online training to persons with, or affected by ADHD. Online classes are available at your convenience, with certification classes available for teachers and professionals. Classes can be taken at your leisure. You may leave a class and resume your progress in the course anytime you wish. 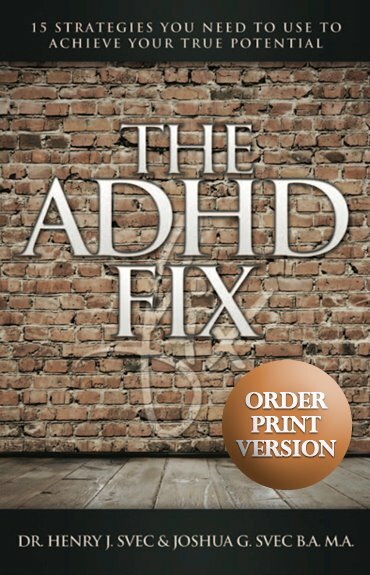 Dr. Henry Svec, helps you understand and lean how to parent your ADHD child. This certification program is unlike any you have likely taken before. It is not offered at a university, college or by your government educational association. You will not receive an increase in pay when you complete this program. This course is not offered by your own employer. The only reason you should take this course is to increase your knowledge and understanding of how to help students diagnosed with ADHD achieve to their potential. You take this class because you are a professional and care for your students. You may also be taking this class because you are volunteering at a school, working with children diagnosed with ADHD. But because this is not part of a formal teacher training program offered at a school, you would need to present your credentials for teaching our provincial or state licensure along with our documentation to verify your qualifications to a perspective employer. To provide homecare workers with basic training to support residents in completing their Exercise Prescriptions to help fight and prevent disease. When it comes to raising your child you want to do all you can to make sure they become a responsible, happy, self-confident strong leader in their families, community, and eventually their career. Psychologist Dr. Henry J. Svec provides you with easy to follow video clips to help you Parent with Courage. A must see for parents, grandparents, uncles and aunts. You will learn how to create unconditional love play sessions and create positive discipline in your home. It’s the only parenting class you will need to take. Joshua Svec B.A. M.A. reviews key strategies which are vital in conquering classes at the University level. This class is available free for all The ADHD Academy Coaching clients. With the increasing number of pre-school children being diagnosed with ADHD, this seminar provides the first step in training childcare professionals in working with children with ADHD. After completing the ExerciseMD Certification Program this course allows users to be mentored with founder Dr. Henry J. Svec over a 6 month period of time. This includes a complete review of 6 client cases, monthly group meetings and access to Dr. Svec during this 6 month time period including text support and response to Trainer questions.